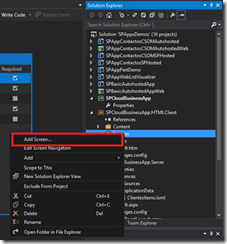 What’s new in Office Development Tools for Visual Studio 2013 RC – Part I! New project templates and features in VS 2013 Preview reviewed in these articles remain almost identical in VS 2013 RC. 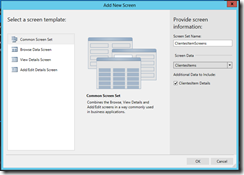 However, there is a new great project template available for building SharePoint 2013 (On-Premises and Online) Apps: the Cloud Business App project template. Open VS Studio 2013 RC, create a new project and choose the “Cloud Business App” project template available in the Office/SharePoint – Apps category. Specify a name for the project and the solution and click the “OK” button. In the next window, you have to specify the URL of the SharePoint site (On-Premise or Online) you are going to use for debugging purposes. The SharePoint App project itself. The “.HTMLClient” project which contains the application screens. The “.Server” project which contains the definition of the business and data layers. As you can also see in the screenshot, VS 2013 RC displays a designer where the developer can start the process of defining a cloud business application. This process implies to define the data entities for the App and the screens needed to interact with the data. At this moment, you can deploy your Cloud Business App in order to test how it works. Just press “F5” key and you will be asked for your SharePoint 2013 On-Premise or Office 365 credentials in order to access to your SharePoint site, add the application and access to it. In my case, since I have specified a SharePoint Online Url for debugging purposes, I have to type my Office 365 credentials. Once the application is deployed to Office 365, the internet browser is launched and you have ageing to type your login credentials. 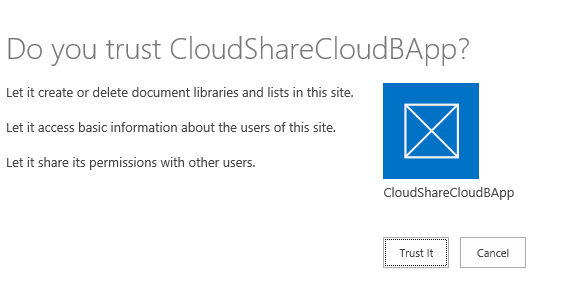 Once you have typed them, you will see the well know web page where SharePoint asks you if you trust in the application that is going to be added to the site. Just click the “Trust It” button. Once the application is added to your site, you are redirected to the application home page. As you can see, there is nothing over there since we have not added yet any entities and screens to the App. We will review how to do that in the next article. And that’s all in this first article about what’s new in the Office Developer Tools for Visual Studio 2013 RC. Happy CloudSharing!